To manage statistics of each of the players, follow the steps given below. 3. Click the Statistics ( ) button in the row of the match, the players’ statistics of which you wish to manage. 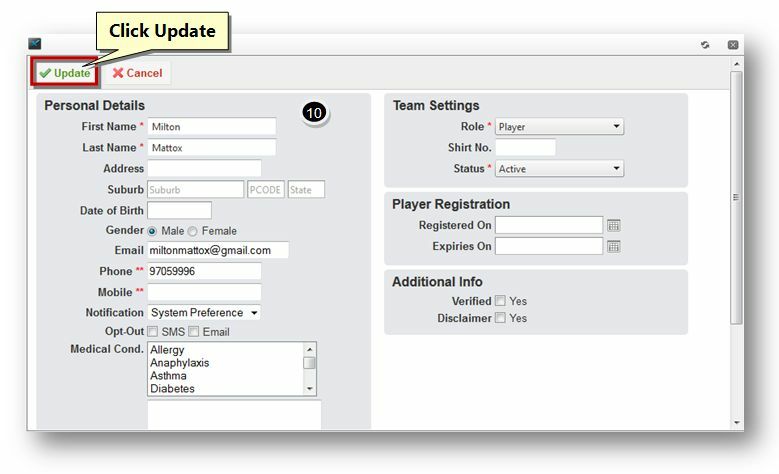 From here you can manage statistics by editing the player’s personal details, statistics and also you can add new player. 4. To add number of votes to the player, click the required number of stars in the Votes field. You can add up to 3 stars. To remove a star, click the remove ( ) button. 5. 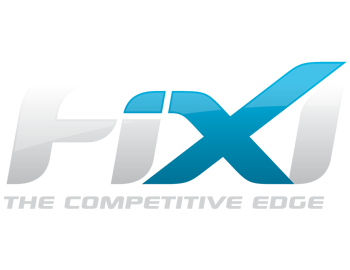 The Finals Eligibility indicates whether the player is eligible for finals or not. The number of matches played for the current season (including finals) is displayed in brackets. 6. Enter the score for the player in the Score field. The total number of scores obtained for the current season (including finals) is displayed in brackets. 7. 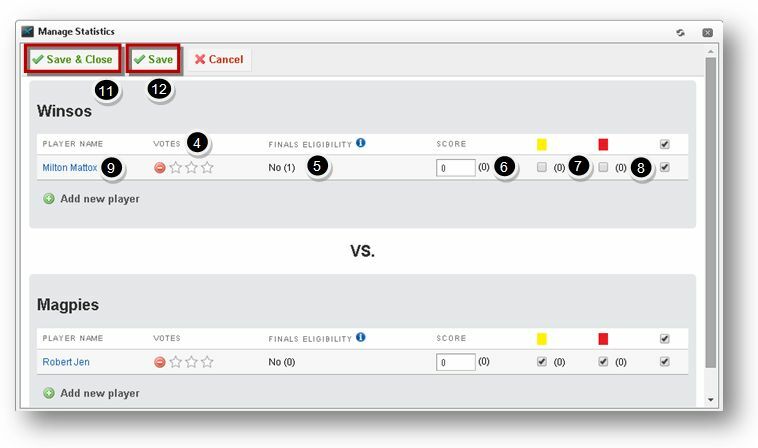 Specify whether the player has received the yellow penalty card or not by checking the box in the Yellow ( ) field. 8. Specify whether the player has received the red penalty card or not by checking the box in the Red ( ) field. 9. To edit the personal details of a player, click the name link of that player. The details of the selected player will be displayed in the edit mode. 10. Make the necessary changes in the fields and then click the Update button. For more information, refer to the following section. 11. Once the statistics of the player is configured, click the Save button and manage the statistics of the other players. 12. Once the statistics of all the players are configured, click the Save and Close button.